Don't you just hate it when you have a special event coming up and you break out in pimples? Well, it happens to me and it happened to me last week just a few days before I got married. EMERGENCY ACNE VANISHING TREATMENT WIPES are the only medicated wipes in Canada that are clinically proven to kill acne bacteria on contact and quickly help heal acne blemishes. They instantly unclog pores removing dirt, oil and dead skin letting oxygen through to help skin breathe and keep bacteria away. Its Benzoyl Peroxide formula reduces the size of pimples and prevents new breakouts. The alcohol free formula prevents over-drying while its oil free moisturizers help relieve redness due to dryness. Dermatologist tested. Personally it just didn't work for me. After a week my pimple was still there. The only things I liked about this is that my face didn't burn and turn red while using these and it doesn't have a strong smell like other similar products I have tried. 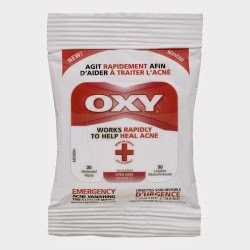 I personally would never buy Oxy at all.